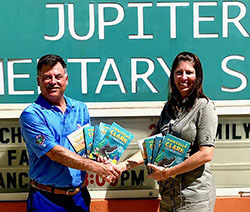 "Building Artificial Reefs for Life"
ARHF DONATES 5 BOOK SET OF THE “PROFESSOR CLARK THE SCIENCE SHARK” TO EVERY THIRD GRADE CLASSROOM IN FLORIDA! The Andrew “Red” Harris Foundation began a significant education initiative in 2018 by donating a 5 book set of the “Professor Clark the Science Shark” series to every third grade classroom in Florida, 55,000 books in all! Children love the story of the little boy (Andrew) who becomes lifelong friends with an orphaned tiger shark pup. The marine animals communicate their needs through Andrew to the human world. Together they clean up a reef and a beach, and then help save a sick turtle as they teach Florida children to love the Atlantic Ocean, Gulf of Mexico and our rivers and lakes. 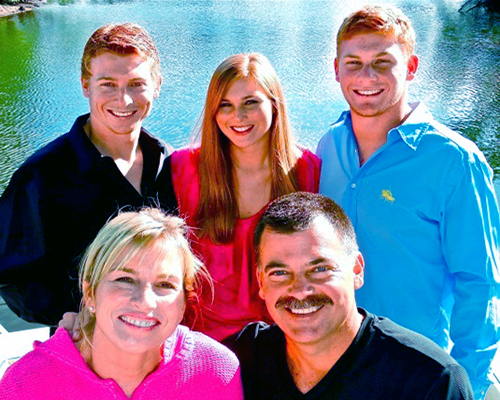 Andrew “Red” Harris was a promising young man and lifelong Jupiter resident. He loved diving and fishing in the ocean waters off northern Palm Beach County. Tragically, Andrew was struck by a boat while saving a friend’s life snorkeling June 8, 2014. His family and friends formed the Andrew “Red” Harris Foundation to honor his memory and assure he is not forgotten. 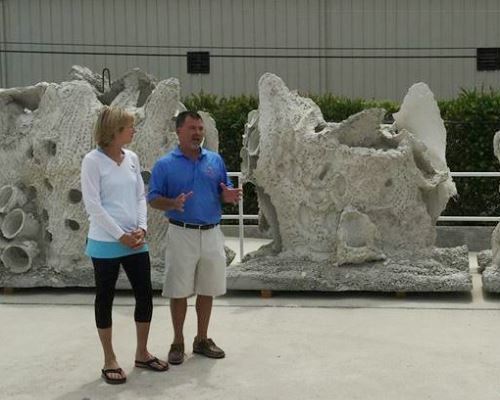 We believe helping to insure the long-term health and vibrancy of our local ocean by building artificial reefs in the waters where he loved to dive and fish off northern Palm Beach County is the best way to do so. 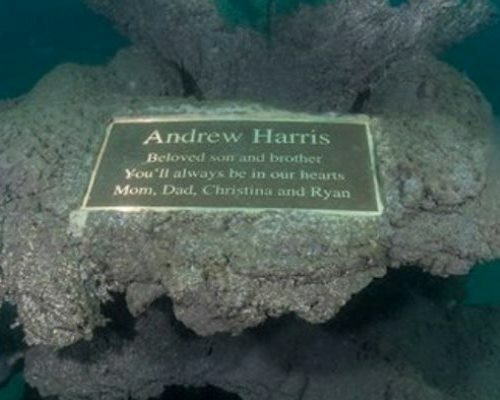 Palm Beach Count and the Andrew “Red” Harris Foundation have worked together as partners over the past 4 years to plan, design, construct and deploy artificial reefs offshore of Jupiter. The partnership was formally created with the execution of a 3-year agreement in 2014. Due to the success of the partnership, an additional 3-year agreement was approved that will run through 2010. 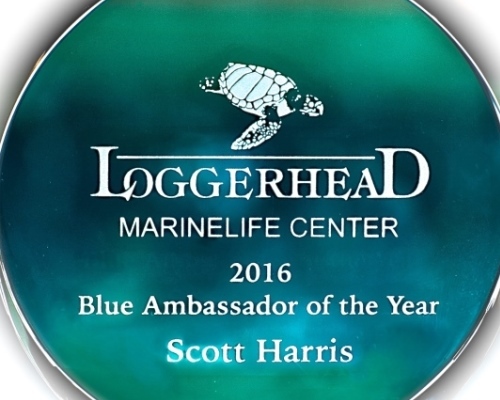 The Andrew “Red” Harris Foundation is a 501C3 founded in July 2014 that strives to build and enhance the marine environment in northern Palm Beach County by creating artificial reefs with huge 8,000 pound “Bahamian coral head” inspired modules to expand our marine habitat. The Foundation’s first reef was built in 2015 with 40 four-ton coral head replicas. A year later, our second project created the Andrew “Red” Harris Foundation No Shoes Reef and began the rehabilitation of a natural reef a mile and half Northeast of the Jupiter inlet that was buried and destroyed by sand decades ago. The reef restoration’s first phase was built with 100 four ton modules and 250 tons of limestone boulders creating a 800′ x 80′ wide footprint. In August 2017 the Foundation deployed 100 more “Coral Heads, ” 34 “Fish House” modules and 1,000 tons of boulder expanding the new reef to 1800 feet long. Gulfstream currents bring the life that is settling on our modules and interact with them to scour away the smothering sand that has been preventing growth on the underlying bedrock. More than 75 kinds of fish swam on the reef, turtles visit to rest and use the reef as a cleaning station, dozens of sea plant species are growing and corals are already returning. A recent study estimates that every $1 spent on artificial reefs produces $138 in economic benefit.